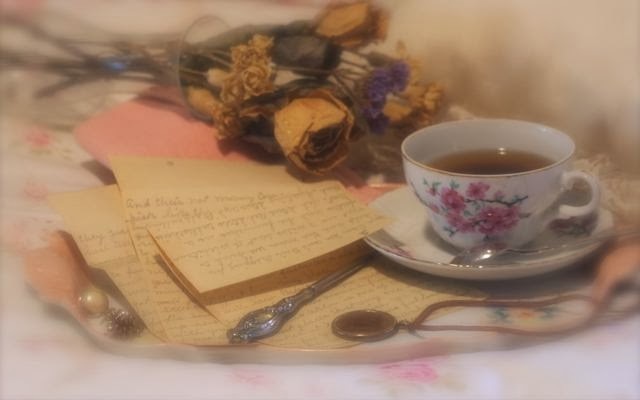 This still life is full of memories... the old letter is from my grandmother, Annie Pope, written to her mother, when Annie was a young wife and away from home for the first time. The cup and saucer was a gift from my sister, Dorothy, and the silver letter opener is an antique that I bought for myself. The gold locket is an antique that a friend gave me many birthdays ago, and the hand painted china tray was from a girl that worked for me for years. The tray is part of a dresser set. The dried flowers were from someone I loved very much. It's all sitting in the middle of my bed while I play with memories.